Guitar stand There are 13 products. Throne with Guitar Stand Function. Height: 650mm. 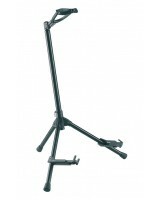 Folding stand for all guitars. Features a patented flexible hooking-in and clamping system which quickly and firmly grasps the guitar neck. 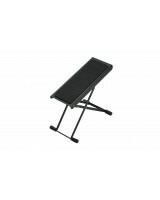 Foldable guitar stand for all types of guitars. Adjustable to various sizes. Support lined in soft plastic to protect the instrument's finish. Adjustable height, easy to use. 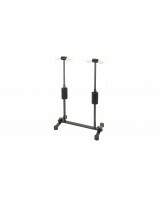 Solid and folding yoke, safety strap to provide additional protection. Stable foot construction with reinforced base. Support For acoustic guitars. Stable, robust, and easy to use. Adjustable from 220 to 350 mm. Coated with exclusive material to protect the finishes of the instruments. Wherever you go! It is perfect to travel. Thanks to its small size, incredible weight of only 400 gr. Adjustable for electric or acoustic guitars. 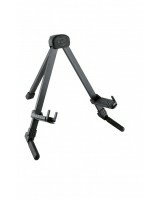 With just a few movements, the compact support is ready to use. Wall support adaptable to a wide variety of guitars. 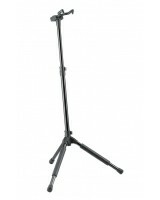 It has a patented flexible hitch and hook system that firmly holds the guitar. High quality mounting plate. Attractive and functional, wall support for guitar made of wood. A reliable and practical way to store the guitar thanks to its metallic core. The attractive cork cover that protects the guitar from bumps, and will retain its shape even after years of use.